In the era of the Time’s Up movement and the National School Walkout the organized collective of women and men’s voices are not only being heard loud and clear, real change is happening. Sexual predators are facing their victims in court, young girls and boys are forcing Congress to look at their position on gun control, and corporations are having a moral check up. When I painted “The Power of a Message” in the spring of 2017 I felt the future of this era upon us last year and wrote a poem to accompany the painting. Our mouths stuffed closed for so long. Blooming forth from our lips. Yes a spectacular shift is upon us all. 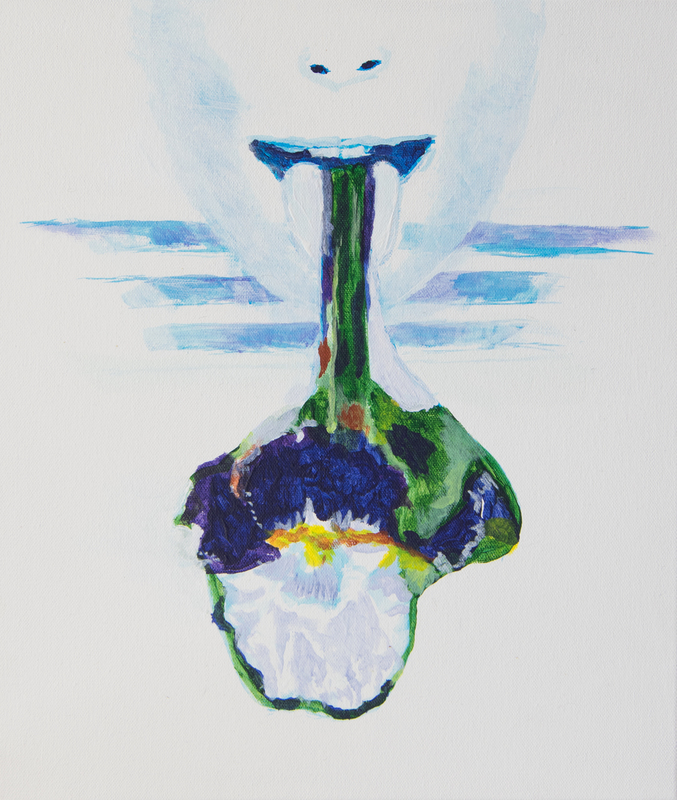 The Flower Power paintings explore female conscience, identity and desire. Their intention is to remind women that it’s essential that we identify and honor our determination to have successful relationships with ourselves, our community, and our world. The faces and poses inspired by print ads were chosen to make a commentary on our lens, our perception of women, our experience of femininity, edited and curated by fashion. This is the third painting to share during Women’s History Month. Each painting has a power, portrait and flower in its composition. The flower meanings are in part a nod to my British heritage and the Victorian garden. Flowers were once used to send messages between lovers. I worked these garden blooms into the paintings to achieve the same ends. The ballerina geranium (envy) in The Power of Envy, the rose (love) in The Power of Self Love, the tulip (fame) in the The Power of Fame, the sunflower (courage) in The Power of Courage, the snowdrop (hope) in the Power of Hope, the lotus flower (compassion) in the Power of Compassion. The iris in The Power of a Message portrait is significant. The purple iris has long been linked with royalty. I chose it purposely to reinforce that all voices are important. The Greek goddess Iris, was goddess of the rainbow and a messenger for the Olympian Gods. This myth has given the Iris flower an eternal link with communication. I painted the work in acrylic on canvas to reflect challenges I have experienced in my own life and that I feel are a common experience for many women. I have loved and been forbidden from showing it, I have loved everyone first, but myself. I have been filled with self-hatred and had to learn compassion. I have taken the journey of forgiving my enemy to free myself from the burden of resentment. Witnessing the Women’s March, watching women fearlessly speak their truth and take action this year inspired this series, “Flower Power.” I wanted to express all of the powers we possess as women. Some considered more uniquely a sign of feminine strength, like the power of compassion. Some negatively associated with the weakness of women in traditional environments, like the power of envy. I wanted to reflect on all of it and turn it on its head. The Power of a Message is there to remind us to speak our truth. Let us shed light on issues important to our communities and to the future of democracy. Find your message and make it bloom. An artist and award-winning best-selling author Camilla produces work to enhance wellbeing and raise social awareness. Her FLOWER POWER: Exploring the Feminine series which launched over Art Basel Miami week in December 2017 looks deeply at female conscience, identity and desire. Her INHALE: Abstract Meditation series of paintings are inspiring others to join her in the art of calming down around the world. Collected globally, Camilla spends her time in pursuit of greatness and gratitude with her family between New York, London and the Florida Keys.